13 year old Jonathan Finn began the 2017 season on April 23rd in Valencia, Spain competing in the Spanish RFME Campeonato de España de Velocidad National Championship at the Ricardo Tormo Circuit. The Bushell Park, SK teen is competing in the 85GP class this year as he starts his second year of racing internationally. 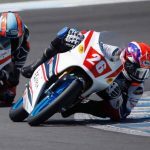 “Racing in the RFME CEV is definitely a huge step in my racing career and the level of competition here is tough but I know I can compete with these guys” said Finn. “My team, XCtech and I tested here at Valencia the weekend prior to the race so I could get to know the track, continue to get comfortable on the bike and work on the setup for this weekend’s race,” said Finn. After a solid qualifying practice, Finn went to work focusing on the overall race objective set out by the team of lowering his lap times and completing his first RFME CEV race. “I got a great start off the line and felt comfortable to push myself and the bike as the race progressed” said Finn. Unfortunately, due to an electrical issue on the last lap, Finn lost power and would eventually have to retire from the race. “Not being able to finish my first race here in Spain is disappointing. I feel bad for the entire XCtech team who have been working hard to help me adjust, but technical issues can happen and it’s part of racing” said Finn. 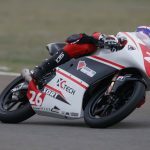 Finn’s progression in the RFME CEV has been evident according to XCtech team boss Xavi Jimenez. “Dealing with a new bike, world championship circuits and racing against some of the best at this level in the world is a big step for all foreign riders coming into the series. Jonathan is a mature and dedicated rider who is adapting well to the bike and we are very happy with his progress” said Jimenez. Jonathan Finn competes with support from Canadian Tire – Cobourg, Arai Helmet Americas, Bickle Racing, Impact Safe-T Armor, Sidi Sport, SPY and DeCal Works.